Ever dreamed of having a robot as a pet? Dream even further! These animal-inspired robots are being used to perform extraordinary tasks, as roboticists turn to the natural world for inspiration. From Octobots to RoboBees, these five extraordinary creations from DK's book Robot will change the way you think about technology. Ever dreamed of having a robot as a pet? Dream even further! These animal-inspired robots are being used to perform extraordinary tasks, as roboticists turn to the natural world for inspiration. From Octobots to RoboBees, these five extraordinary creations from DK's book Robot will change the way you think about technology. Get ready for a high-tech safari! An octopus has no skeleton, and, similarly, there is no tough technology in Octobot’s tiny tentacles. 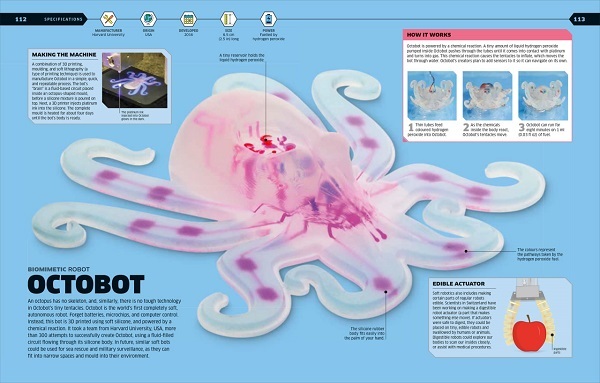 Octobot is the world’s first completely soft, autonomous robot. Forget batteries, microchips, and computer control. Instead, this bot is 3D printed using soft silicone, and powered by a chemical reaction. It took a team from Harvard University more than 300 attempts to successfully create Octobot, using a fluid-filled circuit flowing through its silicone body. In future, similar soft bots could be used for sea rescue and military surveillance, as they can fit into narrow spaces and mold into their environment. Everyone’s favorite Australian animal has taken a technological twist in the form of the BionicKangaroo. This big bouncer can jump like a real kangaroo, reaching 6 inches high over a distance of 32 inches. The German manufacturers studied the kangaroo’s unique motion for two years before perfecting this artificial adaptation. 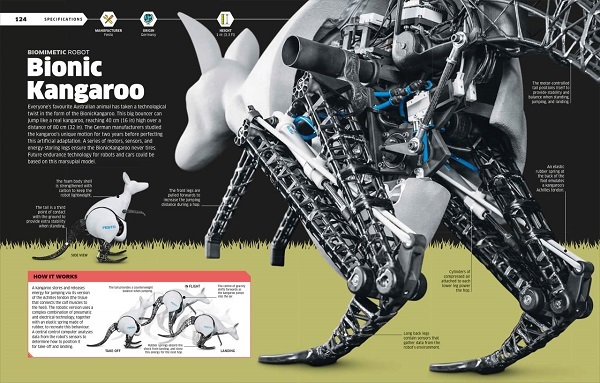 A series of motors, sensors, and energy-storing legs ensure the BionicKangaroo never tires. Great things do come in very small packages. 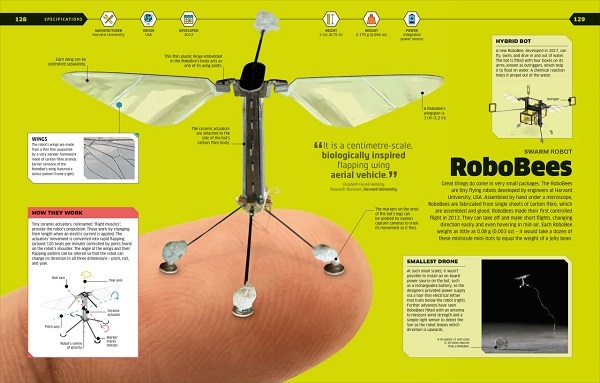 The RoboBees are tiny flying robots developed by engineers at Harvard University. Assembled by hand under a microscope, RoboBees are fabricated from single sheets of carbon fiber, which are assembled and glued. RoboBees made their first controlled flight in 2013. They can take off and make short flights, changing direction easily and even hovering in midair. Each RoboBee weighs as little as 0.003 ounces – it would take a dozen of these minuscule mini-bots to equal the weight of a jelly bean! 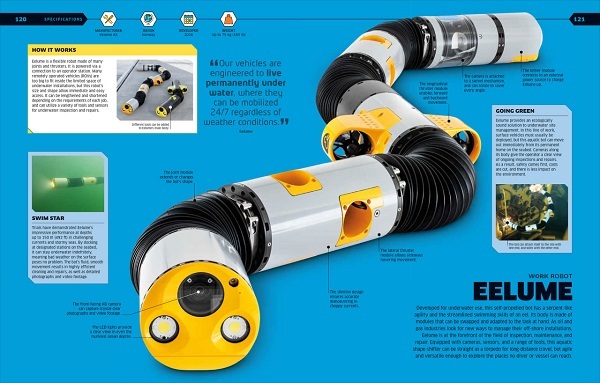 Developed for underwater use, this self-propelled bot has serpent-like agility and the streamlined swimming skills of an eel. Its body is made of modules that can be swapped and adapted to the task at hand. As oil and gas industries look for new ways to manage their off-shore installations, Eelume is at the forefront of the field of inspection, maintenance, and repair. Equipped with cameras, sensors, and a range of tools, this aquatic shape-shifter can be straight as a torpedo for long-distance travel, but agile and versatile enough to explore the places no diver or vessel can reach. 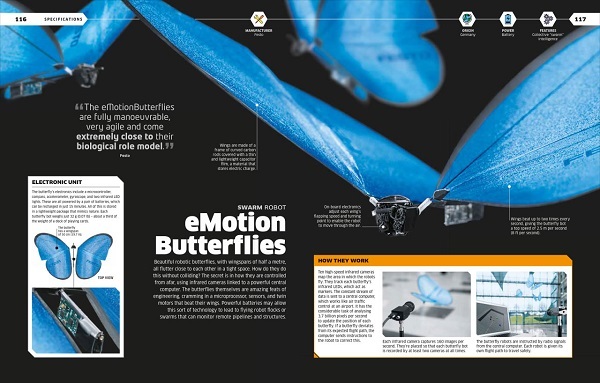 Beautiful robotic butterflies, with wingspans of 1.5 feet, all flutter close to each other in a tight space. How do they do this without colliding? The secret is in how they are controlled from afar, using infrared cameras linked to a powerful central computer. The butterflies themselves are amazing feats of engineering, cramming in a microprocessor, sensors, and twin motors that beat their wings. Powerful batteries may allow this sort of technology to lead to flying robot flocks or swarms that can monitor remote pipelines and structures. 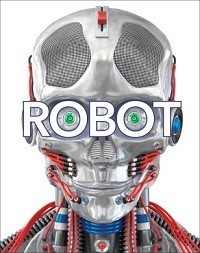 From automata created by Leonardo Da Vinci to modern-day androids and animal robots, this book covers artificial intelligence (AI) throughout history.